Exciting Good Company Players’ Shows, Delicious Food, Great Service and Total Fun …For An Unforgettable Outing! Interested In Organizing A Corporate Event, School Field Trip, Coordinating A Tour Activity, Holding A Fundraiser, Or A Social Occasion With Friends And Family? Our Group Sales Coordinator Can Help You Out! Organizing A Group Is Easy, & Our Group Sales Representative Will Give You The Time & Attention You Deserve To Ensure A Pleasurable Group Outing. 16 Guests Qualifies You As A Group. Put Seats On Hold Now – Pay Later. Tickets Are Available To Groups Before The General Public & Are Discounted. Would You Like To Check Ticket Availability For A Show? It’s Simple! 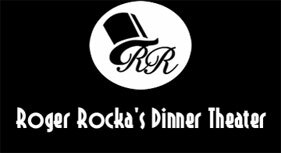 Call us (559) 266-9493 or email us Gather@RogerRockas.com and we’ll get back to you by phone or email. At that time, you can turn this request into a booking. We’ll inform you of all possible group discounts and requirements. Our group sales coordinator is ready to help you. Contact Us Today! Let Us Make Your Next Trip To The Theater A Crowd-Pleaser. Order Tickets Early To Ensure The Best Seats Available! Price includes Table Service Dinner, Show, Coffee or Iced Tea, Tax and Tip. To include dessert, add $6.95 per person. Add to any of the options above. Includes any two drinks including cocktails, wine, beer and milkshakes, plus your choice of dessert with tax included. Does not include tip.